The apartment is in a completely renovated stone house. It is split level, has 2 SAT-TVs, indipendently adjustable air-conditioning in every room, 2 complete bathrooms with showers. 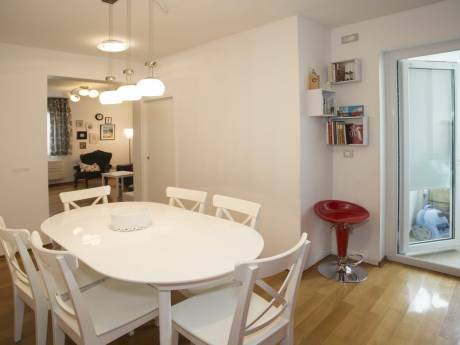 There is a large terrace of about 20 m2. The house is surrounded by a garden with fruit trees and vinyard. We are a retired couple (Peter, 74, professor of languages, and Angela, 71, psychologist). We live mostly on the island, but also have an apartment in Italy (Modena)in an 18th century house, where we spend some months of the year when we are not travelling. LONG-TERM exchanges considered. Please note: We kindly ask all prospective exchangers to check carefully our exchange periods to avoid unnecessary correspondence. The house is situated 30 min. by ferry from the ancient and lovely city of Split. 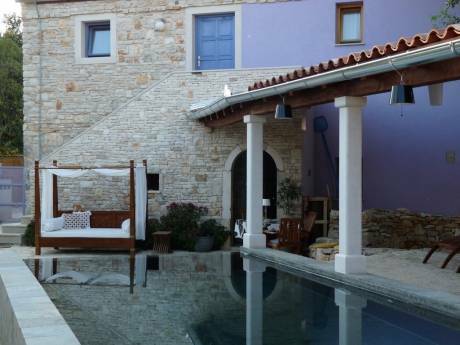 Located on the hill with views onto the port of Rogac and the bay of Split. It is the last house in a small street of 3 houses adjoining a pine forest. The port/ferry for Split is 5 minutes walk away while the nearest shops and facilities (chemist, etc.) are about 800 m away. 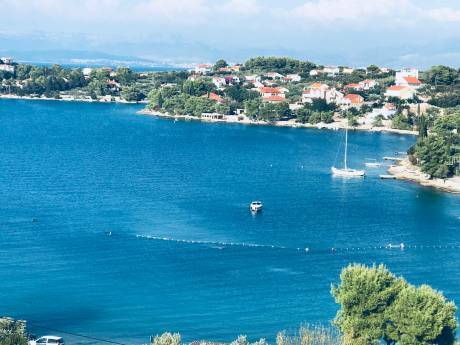 Solta is a small, but intact island with lots of natural charm. It has a relatively mild climate. Frost is practically an unknown word and even on the coldest day temperatures during the day can easily rise to 10-12 deg. C. The island of Solta is a peaceful and relaxing place. Split with its opera house, museums, Diocletian Palace, also offers shopping facilities that leaves nothing to be desired. English is spoken everywhere. Dubrovnik is 3 hours drive away, or by ferry, and there are many more places of interest worth visiting. The sea is crystal-clear and swimming is possible from May well into October. We are offering a newly furnished accommodation which we take great care of since we know how important it is to welcome guests to clean and comfortable surroundings. We treat with the same care and respect our exchange homes. Note: we do not exchange during the summer months (June, July, August), since the apartment is rented out in those months.